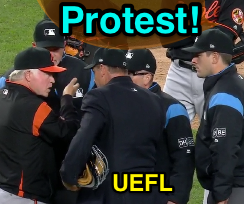 Baltimore filed the first protest of the 2018 season Friday night after umpires declined to rule a double play on an odd rundown play during the Orioles-Yankees game that saw New York's lead runner, Giancarlo Stanton, retreat past third base and into left field as teammate and trail baserunner Gary Sanchez stood on the bag itself. Meals, Kulpa, Hickox & May listen to Buck. The Play: With one out and two on (R1, R3), Yankees batter Neil Walker hit a ground ball to Orioles pitcher Richard Bleier, who threw to third baseman Tim Beckham, to catcher Caleb Joseph, as baserunner R3 Stanton became trapped in a rundown between third and home. As Joseph ran Stanton back to third base, trail baserunner R1 Sanchez advanced to third, stepping onto the base with his right foot. With R1 Sanchez standing on third base—and even appearing to motion Stanton to stop—R3 Stanton continued his retreat, running straight through third base and up the left field line before veering into foul territory. Catcher Joseph first tagged Sanchez on third base as Stanton ran into left field before giving chase to, and tagging, Stanton as well. U3 Kulpa observes F2 Joseph's chase of R3. 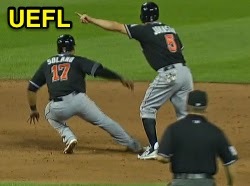 The Call: 3B Umpire Ron Kulpa gave no signal when catcher Joseph tagged R1 Sanchez while Sanchez was in contact with third base, and ruled R3 Stanton out when Joseph tagged him beyond the base in foul territory. 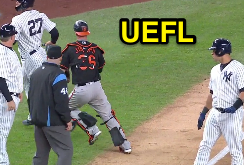 Upon consultation with HP Umpire Ed Hickox, 1B Umpire and Crew Chief Jerry Meals, and 2B Umpire Ben May, Kulpa's ruling stood and Stanton was declared out, Sanchez "safe" at third base, and batter-runner Walker aboard safely at first. 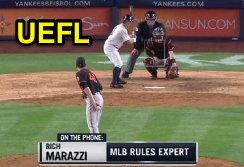 MLB rules expert Marazzi is on the phone. Analysis: The first bit of analysis is to applaud YES Network for calling Rich Marazzi and putting him on air. As Rich surmises, the proper outcome is a double play...but why is that? After all, when R1 Sanchez was tagged, 1) he was on the base and 2) Stanton was not. What Went Right: Kulpa properly did not call R1 Sanchez out on the tag, and properly called R3 Stanton out on Joseph's tag, but this is where Quality of Correctness falls below the Mendoza line. What Went Wrong: When R3 Stanton retreated past third base while R1 Sanchez was in contact with the base, he caused R1 Sanchez to commit the offense of passing a preceding runner. Thus, while Sanchez was not out as a result of Joseph's tag, he was out for passing Stanton, even though Stanton looked to have caused the situation (it is the trailing runner's responsibility not to pass a preceding runner). The relevant rule is OBR 5.09(b)(9): "Any runner is out when: He passes a preceding runner before such runner is out." R1 is legal because R2 never retreated past 2B. When it comes to a trailing runner passing a preceding (lead) runner between the bases, baseball generally requires one runner's body to physically pass the other's—for instance, runners are allowed to touch each other without consequence, for this is not considered "passing." When it comes to a potential runners passing situation at the base, we consider an MLB Umpire Manual interpretation, which states, "A runner is considered to have passed a base if he has both feet on the ground beyond the back edge of the base or beyond the edge of the base in the direction to which he is advancing." Diagram of when a runner has passed a base. Though this base passing interpretation ordinarily applies to forward progress as runners advance, it is also applicable to retreating runners. This most often occurs during fly out/tag-up situations, where an existing baserunner (e.g., R1), generally running on the pitch, runs past a base, only to return to his base of origin in order to tag up on the caught fly ball. In this case, determining whether the baserunner is past or prior is vital to see if the runner must legally retouch the leading base he may have passed (e.g., for the R1-running-on-the-pitch fly-out play, this would be second base). Related Post: Rare Real-Time Appeal Retires Runner over Retouch Rule (6/15/17). Related Post: Past or Prior - Deciding When a Runner Has Passed a Base (7/1/17). PLAY—Runners on second base and third base with one out. The runner from third base (i.e., the lead runner) makes an advance toward home and is caught in a rundown between third base and home plate. Believing the lead runner will be tagged out, the runner at second base (i.e., the trailing runner) advances to third base. Before being tagged, the lead runner runs back to and beyond third base toward left field. At this time, the trailing runner has passed the lead runner as a result of the lead runner’s actions. As a result, the trailing runner is out and third base is unoccupied. The lead runner is entitled to third base if he returns to touch it before he is out, see Rule 5.06(a)(1), unless he is declared out for abandoning the bases. Suffice it to say, 🚨this is exactly what happened🚨. Lead runner R3 Stanton retreated toward third as trailing runner R1 Sanchez advanced to third base. 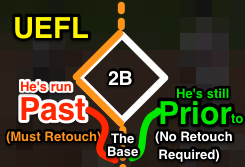 Before being tagged, R3 Stanton ran back to and beyond third base toward left field, thus running through the past/prior barrier, as depicted above. By rule, R1 Sanchez passed Stanton as a result of Stanton's actions, meaning, R1 Sanchez is out and R3 Stanton is entitled to third base if he returns before he is out...except that fielder Joseph tagged Stanton while off his base, meaning that both baserunners were out. As for abandonment, let's be clear. U3 Kulpa ruled Stanton out on the tag. Abandonment isn't at issue. Showalter argues his point to no avail. Long story short, this double play was missed, may have resulted in an affirmed protest if Baltimore lost the game ("may have," because New York failed to score in the 6th inning, so MLB could have ruled that the incorrect rules application did not affect the outcome of the game), and, had there been an ejection, would have resulted in a QOC of "Incorrect." It's rare that an MLB game is protested, and it's almost unheard of to have a protest with merit. The last upheld protest—in 2014—concerned a grounds crew that botched its unfurling of a tarp during a Chicago rain delay, and this followed 28 years of no protest having been upheld across the major leagues. What's more, the 2014 protest had absolutely nothing to do with a rules application regarding actual gameplay: it was a rain delay and the decision of suspension vs. calling the game as final. MLB even acknowledged its rain delay tarpaulin rules were deficient and changed the applicable rule during the ensuing offseason. Not so much here, as Rule 5.09(b)(9) Comment fits the Stanton/Sanchez play to a T: MLB won't have to change any rule to account for Friday night's play. Related Post: Protest Upheld for 1st Time in 28 Yrs in SF-CHC Rainout (8/20/14). MLB punished Culbreth's crew for its mistake. 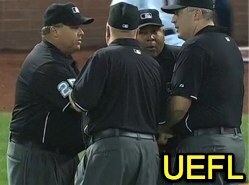 The last meritorious MLB protest concerning a bungled gameplay rule occurred in 2013 when Angels Manager Mike Scioscia alleged that Crew Chief Fieldin Culbreth and umpires Brian O'Nora, Bill Welke, and Adrian Johnson failed to enforce then-Rule 3.05 (now 5.10(g)), which requires a substitute pitcher to pitch to the batter then at bat or any substitute batter before that pitcher is removed from the game. Culbreth's crew had allowed Astros Manager Bo Porter to replace his just-into-the-game substitute pitcher in response to Scioscia's decision to bring in a pinch hitter, without that pitcher having thrown a single pitch. Faced with a less desirable pitcher on the mound, Anaheim's Los Angeles' batter flew out to end the inning. Related Post: Angels Protest After Wright Exits Without Throwing a Pitch (5/9/13). As the Orioles ultimately won Friday's game in New York, the Angels won 2013's game in Houston, meaning that Scioscia's protest was effectively dropped. 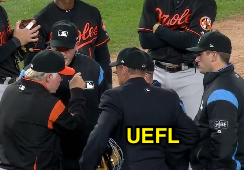 Nonetheless, MLB publicly punished the umpiring crew for the rules misapplication, suspending Fieldin Culbreth and fining O'Nora, Welke, and Johnson, for failing to apply a rule. Related Post: Culbreth Suspended; Johnson, Welke & O'Nora Fined for Pitching Change Fiasco (5/11/13). Will Meals, Kulpa, Hickox, and May suffer a similar fate for their collective rules error? Stay tuned. Sidebar: Had both runners been tagged while simultaneously occupying third base, lead runner R3 Stanton would be safe and trail R1 Sanchez would be out. Related Post: Right of Return - When Two Runners Occupy One Base (4/3/18).